This bright and colourful Fruit Mania Plus 2 Video Redemption machine is on the forefront of arcade videmption technology! A modern twist on the coin pusher, players engage in fast action coin pusher game play on a massive 47 inch LCD screen - with their winnings in the game converted into tickets at the end. Fruit Mania Plus 2 is a skill based video redemption game featuring a 47 inch LCD screen. With all the action taking place on the screen, players shoot coins rapidly at moving fruit shaped character targets. Hitting and knocking over these colourful creations releases a heap of gold coins which fall onto the graphics generated pusher deck and push coins and gift boxes off into the win hole. If coins or gift boxes fall down a centre chute, this then starts the bonus spinner. There are several bonus features to achiev including the "Pearl Jackpot" feature. The player collects points based on how many coins and gift boxes drop into the win hole as well as the points from bonus and jackpot features. At the end of the game the points are converted into tickets.The price of play, percentage payout and the amount of coins to fire per game are fully adjustable. The cabinet is attractive and eye-catching cabinet featuring a large character header, light display and a built-in seat area. Plus 2 is the deluxe version of the fun but challenging Fruit Mania. With its attracive look, fun gameplay and bright and engaging screen graphics, the Fruit Mania Plus 2 Video Redemption Machine is sure to be a major drawcard to your commercial location! 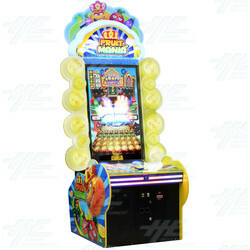 This bright and colourful Fruit Mania Plus 2 Video Redemption machine is on the forefront of arcade videmption technology! A modern twist on the coin pusher, players engage in fast action coin pusher game play on a massive 47 inch LCD screen - with their winnings in the game converted into tickets at the end. Fruit Mania Plus 2 is a skill based video redemption game featuring a 47 inch LCD screen. With all the action taking place on the screen, players shoot coins rapidly at moving fruit shaped character targets. Hitting and knocking over these colourful creations releases a heap of gold coins which fall onto the graphics generated pusher deck and push coins and gift boxes off into the win hole. If coins or gift boxes fall down a centre chute, this then starts the bonus spinner. There are several bonus features to achiev including the "Pearl Jackpot" feature. The player collects points based on how many coins and gift boxes drop into the win hole as well as the points from bonus and jackpot features. At the end of the game the points are converted into tickets.The price of play, percentage payout and the amount of coins to fire per game are fully adjustable. The cabinet is attractive and eye-catching cabinet featuring a large character header, light display and a built-in seat area. Plus 2 is the deluxe version of the fun but challenging Fruit Mania. With its attracive look, fun gameplay and bright and engaging screen graphics, the Fruit Mania Plus 2 Video Redemption Machine is sure to be a major drawcard to your commercial location!